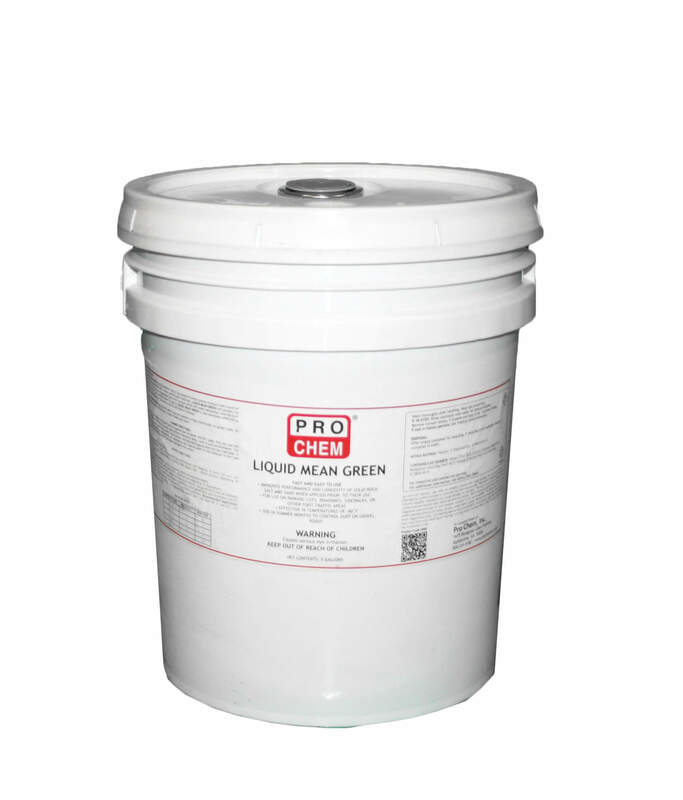 Liquid Mean Green | Pro Chem, Inc. LIQUID MEAN GREEN is the sure way to stay ahead of winter storms and ensure safe pedestrian and vehicular travel. When used as a pretreatment, it prevents the bonding of snow and ice to pavement and other surfaces, which makes clearing much more efficient. This product is extremely effective in melting snow and ice in temperatures as low as -60°F on a multitude of surfaces. LIQUID MEAN GREEN can also be used in the summer to control dust on gravel roads, construction sites and any other dusty area by absorbing moisture from the air. For complete directions, see label. Anti-Icer/Prewetter: Spray on pavement before precipitation. Use ½ gallon/1,000 sq. ft. Adjust dilution depending on requirement. Deicer: Effective deicer when applied on top of snow and ice. On glazed ice, it may be necessary to score the surface in several places before applying to aid penetration and to prevent run-off. More than one application may be necessary in extreme conditions. Use 1-2 gallons/1,000 sq. ft. near 32°F on thin ice. Use 3-6 gallons/1,000 sq. ft. below 10°F. Accelerator: Significantly improves the performance and longevity of solid rock salt and abrasives like sand. Use 1/3 gallon/1,000 sq. ft. Adjust dilution depending on requirement.